We left for the airport this morning at 7am! When we arrived at the airport there was a mix up with our tickets! Oh boy!! I thought for a second we would not be leaving at all but after about 30 min they got it worked out and we were on our way! The flight was great! The airlines are always so great at getting us in the front of the plane! Makenzie just hung out in my lap while I watched a movie on the computer! Then we were off to baggage claim! I always have to laugh at the looks on peoples faces as we walk through the airport! There was one gentleman that was very concerned and asked me where my husband was and why I was doing this alone!! LOL!! I looked at him and told him that his guess was as good as mine! The look on his face was priceless! We got on the shuttle and got our rental car without any problems! They even pulled it up to the front for me so that I didn't have to lug all of our stuff across the parking lot! After loading up the car.. which reminds me of why I can't own a nice small little coup.... we were off! For any of you that don't have a GPS... GET ONE!! After I booked this trip I began saving for a TOM TOM because as a single woman driving around in LA I had NO desire to be lost for ONE second! I plugged my new best friend in and he guided me all the way to our beach house with no problem!!! The beach house is BEAUTIFUL!!! I have a garage to park the car in. A washer and dryer, kitchen, and the most fabulous view of the ocean one could imagine! When we walked in there was a gift for Makenzie and I! This brought me to tears! I was so touch by this and could just feel God radiating over us! WOW! I unpacked and off we went to the beach! One block from our condo! Makenzie LOVED it!!!! We had to leave because she was so excited that she made herself gag and puke 3 times from laughing so hard! It was GREAT!!! Then we used TOM TOM again and found a grocery store and an In and Out Burger and home we went. I got Makenzie ready for bed and she is out like a light!! Tomorrow Makenzie will have an evaluation at NAPA! Please pray that she gets a therapist that understands what she needs. Thank you for all of your prayers! We love you! Makenzie slept well! She has still been throwing up during the night ever since she was put under! Not sure what that is all about but none the less she is still sleeping well! We left for therapy this morning and navigated LA in rush hour! I really wasn't any worse then home other then that the roads in LA do weird things! LOL! We made it just in time and were ready to go! Today was a day for the therapists to get to know Makenzie! They messed with her and fitted her suit to meet her needs! They were really great! I feel like they understand Makenzie and know how best to give her what she needs! We also had a GREAT time hanging out with Joey and his mom, aunt, and cousin who are also all there for their kiddos! 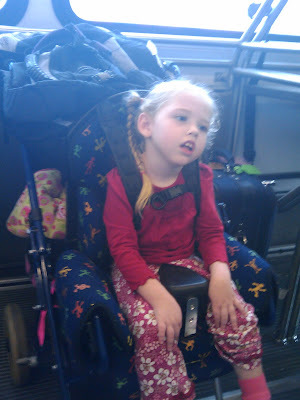 There are also 3 other little girls here that are the same age as Makenzie with similar needs! WOW! God is so good! Even though this is a therapy trip it is so great to be with people that we know and kinda feels like a vacation! LOL! I am sure that will change tomorrow when we get to the REAL therapy! 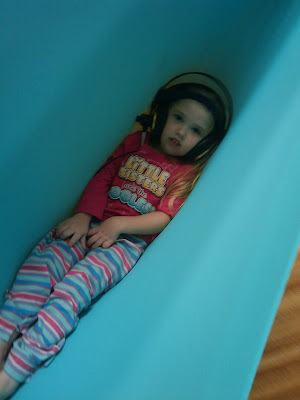 Makenzie also started her listening therapy this afternoon. In short... she HATED it! I think most of it is that she really doesn't like anything on her head! We started with a hearing test. There are defiantly frequencies the HURT Makenzie! Oh did she cry!!! We had to stop because she would not concede but I think we got a good baseline! We Will try a repeat in about 8 days. We then went out and sat on the trampoline and Makenzie listened to her special music for 1.5 hours. She seemed to do ok with that as long as the therapist was no where near her! LOL! Anytime she came around Makenzie would stick out her lip and start to cry! Smart girl! As much as Makenzie doesn't like Ms. Jennie, I LOVE her! She has so much knowledge and I plan on picking her brain for the next 3 weeks!!! We headed home and after mommy made herself something to eat we headed out to the beach!!! Once again Makenzie LOVED it! She is totally a beach baby! After my back started to cramp up I decided I would just sit with Makenzie and let the surf roll over us. She loved that too! We left the beach covered from head to toe in SAND!! The walk back may only be less then a block but it feels like miles! Makenzie is getting so big! I can't push her chair in the sand so that leaves me to carry her! I have been brainstorming cheap ways to be able to pull her and I think I have a couple options! I will let you all know if they work! When we hit the door we were both soaking wet and covered with sand! It was a site to see! You all would have been rolling on the floor!!! Did I mention there is no bath tub? Yeah! Crazy! At the end of the day we were both mostly free of sand (i am sure I will be taking beach sand home with me against my will... that stuff gets EVERYWHERE! ), clean, and all ready for bed! I feel so blessed! First, to my mom and dad for making this possible as they are home with the boys! Also to my boys for understanding why mommy has to be away from them. Second, to Discount Tire for paying for this wonderful therapy. Third to the owner of this condo for opening up his beautiful home for us to stay in! Fourth, that we are with so many wonderful people here! SANDY AND BLESSED!!! God is so good!!! 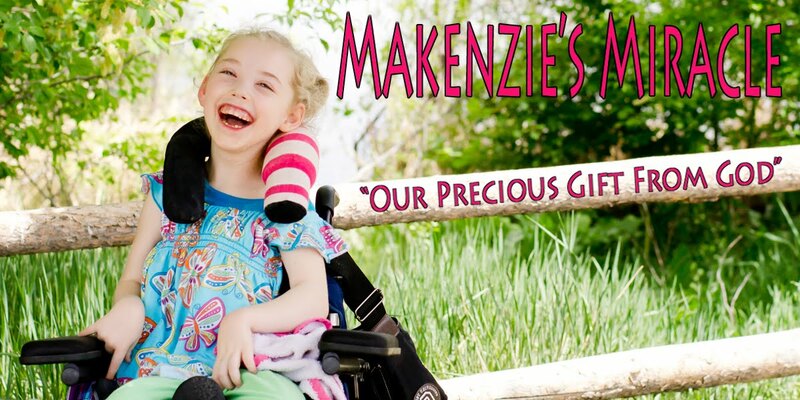 Pray for Makenzie tomorrow as she will be pushed harder then ever before! Pray that she will fight through it and learn new things! God, please bless my princess with the miracle of healing! Please pray that she stops vomiting at night and that she stays HEALTHY!!! That is SOOOOO important! Pray!!! What a day! 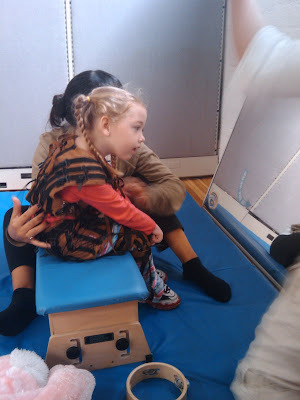 Today was the 1st real day of therapy for Makenzie! She did GREAT!! She did cry a good deal but I guess we can count that as FREE respatory therapy! We started with some stretching and ROM. 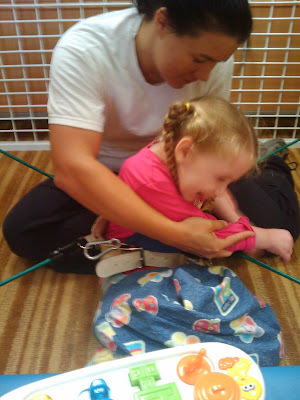 (Range of Motion)Then we put her in the suit and worked a bunch on sit to stand, weight shifting, and tall kneel. Then we moved into the spider cage. Makenzie hates to be in all four's, tall kneel and side sit! We worked a ton on these today! It was GREAT....other then the crying! Makenzie was so loose afterward! Then we worked with weights. Makenzie loved watching the dog move up and down when she kicked her leg! I think this was her favorite part of the day! After that she stood for about 30 mins!!! WOW! This is just what she needs to keep those hips nice and healthy!!! Wheew.... we're done... or were we?.... NOPE! On to listening therapy! She did much better today and even sat with Miss Ginnie for a bit without crying! Yeah! Ok now we really were done and on our way home!!! Then of course we had to go see the ocean!!! Thanks Julie for the wagon!!! All in all it was a good day!!! Makenzie did very well! I can't wait to see how much Makenzie learns in the next few weeks!!! PRAY!!! Makenzie had a much better day today. There was a lot less crying and a lot more smiling! We worked at lot on tall kneel again today. Makenzie did great and was putting a ton more weight into her knees. Yes she cried but it looked a lot better! The still picture I took today were with my phone as my camera battery died! They are not the best but better then nothing! 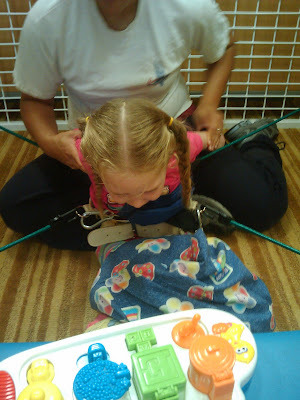 While in the Neuro Suit we also worked on side sit to both sides with weight bearing through her wrists, arms, elbows, and shoulders. It took her much less time to adjust today. Then she worked on sitting. She loved playing the drum! She was able to keep her knees bent mush easier today. Makenzie also used the Kid Walk. This is not my favorite walker but she did a great job standing with weight bearing and weight shift. During hours three and four Makenzie worked in the spider cage, lifted weights, and standing. In the spider cage we worked on long sit, side sit, and all fours. Last but not least was standing! Makenzie did great! They had her bearing more weight today and doing a LOTS of weight shifting! She kept her head up so well! Go Makenzie! Then we had a short luch break with all of our friends! Makenzie tasted some of my soup and some ravioli! She really seemed to like it!! Then it was onto listening therapy. 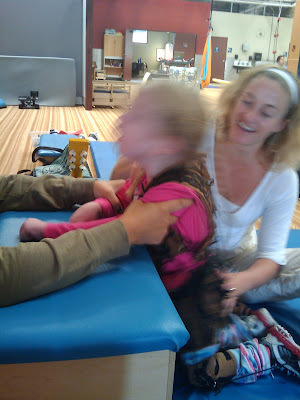 Makenzie sat with the therapy assistant for a while and pretty soon she was sound asleep!!!! About 20 min later Makenzie woke up and Gennie put her in a hammok like swing that she LOVED!!! After therapy I had 2 stops to make! This was not a good plan! Makenzie was so tired! We made it though! She is out like a light! Her reflux seems to have flared up a bit tonight but she seems to be doing ok! Please pray for continued health and healing! It is SOOOO hard to watch her cry but this is soooo good for her! Please also pray for my boys as it has been hard for them to ajust to mommie not being there! Thanks so much!!! Why do I do all of this? Makenzie did well again today! Man did they ever work her HARD!!! She did not sleep very well at all last night. She was very restless and kept clacking like she had a tickle in the back of her throat. I am sure her throat is a bit scratchy after all of the crying she has done in the last 3 days! Poor Girl! Letting her cry like that is REALLY hard to say the least but it is what she needs! She needs to be pushed out of these bad patterns that her brain continues to be stuck in! It is about repetition! Development works that way with every child. Makenzie just needs more then the average Joe! Makenzie is SOOOOOO loose! Today when we were doing side sit her hips fell right into it and we didn't even need the sandbags to keep her from pushing her legs out! This is HUGE!!! As soon as they put the neuro suit on her this morning they set her up on the treadmill. She has NEVER done this before! 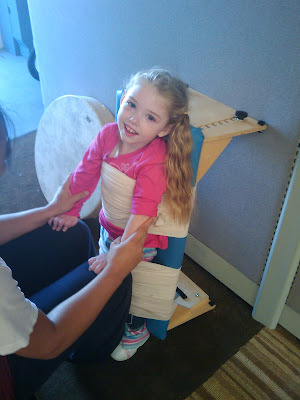 I have asked at her therapy clinic but they do not have the right equipment for a child Makenzie's size. Makneize HATED it! She screamed and screamed! I asked if they thought it hurt her and they said it probably did. Why? Well, because Makenzie is used to only being in forward space. 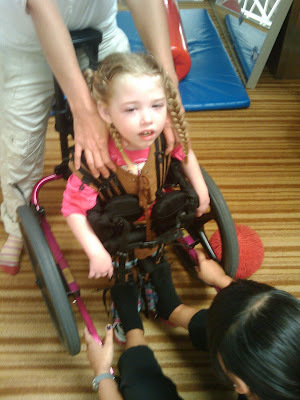 The treadmill with the help of the therapists required her to not only step forward but bring her leg and hip all the way back to step. This is not something that Makenzie's body is used and it is very tight. So good, Oh so good!!! To add insult to injury, as soon as they where done on the tread mill they put Makenzie in the crawler and had her wheelbarrow walk, on her hands, across the clinic! This is one of her LEAST favorite activities! She cried through out that as well! 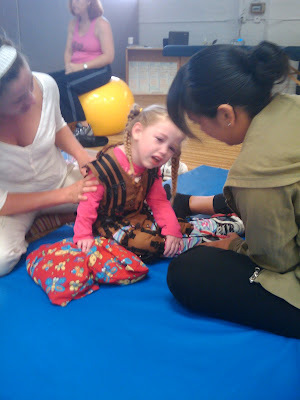 At the end of the day she was ALL smiles and layed so nice for listening therapy!!! Not one tear there! I am really enjoying our time here! The Napa Center is AMAZING!!! The therapists WANT to be there! They love these kids and have so much knowledge! They do not get frustrated and they sure never give up on ANY child! When they say 4 hours of therapy they are not lying! Makenzie gets a 15 min break at the half way point! WOW!!! I am soooo proud of her! AMAZING!!!! This is how Makenzie looked at the end of the day today! All spread out on her back! No ball (flexed) baby here! WOW!!! Results... yeah... I can't wait to see what happens by day 20!!! Today was "fun friday". Ya well, not sure about the fun part but it was Friday! Makenzie worked really hard again today. She got to fly in the cage and she really liked this. She even got her head up for a bit which is hard because it makes you work your neck, shoulder, and back muscles against gravity! Go Kenzie! I took video but for some reason dropshots won't post it here. Makenzie also worked on sitting on the bench as well as sit to stand. She wan't to happy about the stand part but she did really well with the sitting part. 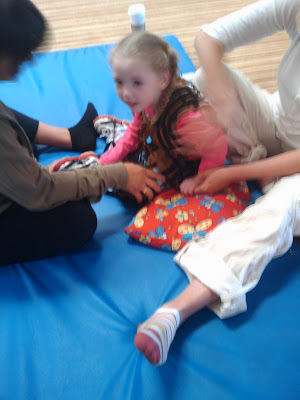 As always we focused a lot on weight bearing through her hands/arms/shoulders! If you would like to watch the vidoes or see the rest of the picture from today please check out www.dropshots.com/makenziesmiracle. For some reason tonight it will not post the videos correctly here. I am going to keep it short and sweet tonight as a good friend drove down from Northeren CA to hang out. Please keep praying for Makenzie! Pray that God would lay his healing hand on her! Believe... Prayer Works! This weekend a good friend of mine drove up from Northern CA with her oldest daughter to see us. It was so great to see her again! I met her when Kaleb started Kindergarten. We were the 2 moms with the double strollers full of kids... to many to count...lol! It turned out that our kids would end up being best friends, our youngest children were around the same age and we both had kids that went to preschool at the same time. We spent many of days having picnics in the park or eating lunch in the school cafeteria waiting for our kids. After Makenzie's accident she was ALWAYS there for me! She watched my kids while Makenzie was in the hospital and when we were gone for therapy. LIVESAVER! 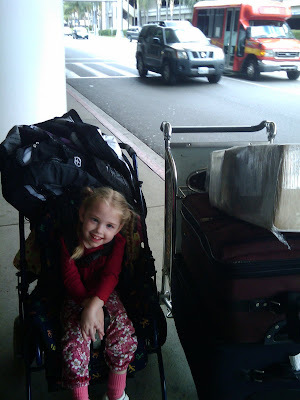 A bit more than a year ago the military took her away from CO and transplanted her in CA. Kaleb was devastated and so was I! When their family's time is up in CA (3 more years) they plan on coming back to CO. That day could not come soon enough... but until then, this girls weekend was GREAT!!! We decided to play tourist a bit and drove down to Long Beach to see the aquarium. We got in the car and plugged TOM TOM in and off we went. I really don't enjoys driving and it is no exception in LA! As we got on the 405 I was proud! I made it! I was driving on a CA highway! Silly right?.... Not for me! For the last week I have been avoiding California highways like the plague! We got close to Long Beach and my GPS kept telling me to stay left... so I did. Then it piped up and told me to turn right... WHAT! We laughed and got over and made it off the highway on the right exit. Then it turned us around back onto the 405 going the opposite way. Hadn't we just come from there? We both looked at each other in a very confused state and just shrugged. This was our girls adventure right? Then I remembered the few times in the past that I have tried to out smart the GPS. Long story short, it was always right and I was always wrong! So kept doing what TOM TOM told us to do and low and behold we made it!!! This reminds me of what is is to trust in God. Sometimes it doesn't make a whole lot of since but in the end he is always right and we are always wrong! I have been thinking about that alot the last couple of days. Thinking about all of the therapy we have done for Makenzie. Even though sometimes it hasn't made a lot of since and it was hard, I know that God brought us to each and every place we have gone. The thing is.. Makenzie is not the only one that these trips was intended to help! Looking back at every single one of them I can see SOOO much more then just therapy for Makenzie that came out of them. God has showed his hand in one way or another EVERY time. He wastes NOTHING! Ok....Back to the Long Beach trip!! LOL! The aquarium was GREAT! Makenzie loves fish! I knew this because the highlight of every trip to the hospital at home is to sit and watch the fish in the many tanks they have there. She was soooo engaged and watched everything! The best part was to see how good her tracking has gotten! She was able to find something and watch it back and forth. I think what really amazed me is when we got to the sea lions. Though guys are quick! She would sit and look for them and then one would shoot across the tank and she would sit and follow it all of the way until it disappeared to the other side of the tank! WOW!!! After about and hour we went on a boat tour of the Long Beach Harbor and that too was awesome! Then it was time to have lunch! I have been trying to find an opportunity to make it to Chilies as proceeds are being donated to St Jude's and childhood cancer this month. Low and behold there was a Chilies right in front of us when we got off the boat! Awesome!!! If you get a chance to eat at Chilies on Monday Sept, 28th ALL of the money made that day goes to St. Jude's! What a great cause! I really wanted to go then but there is no way Makenzie can do a sit down dinner after 6 hours of therapy! After lunch we went back to the aquarium and Makenzie got to touch sharks and other sea creatures! We left about 6pm! It was a GREAT day!!!! Below are a few pictures. More can be found on Makenzies dropshots. We are back to therapy tomorrow! Please pray that it goes well and Makenzie gets stronger, learns more, and HEALS! Pray for God's healing and protection!